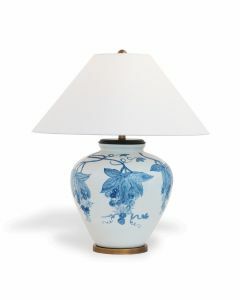 This is our designer classic double gourd shaped lamp. Featuring a honeycomb pattern in brown on white porcelain, the lamp is accented with brass hardware, solid brass base and crystal ball finial. It features a 3 way switch and takes a 150 watt max bulb. This lamp measures 36"H x 20"D ; the shade measures 18” x 20” x 13”SH. The shade is a tapered round hardback shade with a soft rolled edge and is made of an ivory polyester fabric with a brass spider. Materials include porcelain and brass. Click on images for greater detail.